Have you heard of the concept of hygge? Pronounced ‘hoo-ga’, the Danish word literally translates as cosiness and originates from the Norwegian word for ‘wellbeing’– but the concept means much more than that. Drinking a cup of hot chocolate in front of the fire is hygge. Having dinner with friends is hygge. Wrapping up in a blanket is hygge. This is all undoubtedly a little abstract, so a good definition to refer to is that hygge is: “the absence of anything annoying or emotionally overwhelming; taking pleasure from the presence of gentle, soothing things”. But how, we hear you ask, does this relate to interior design? In recent years, Scandinavian interior design has become hugely popular. And, as with the concept of hygge, its origin in a Nordic country that experiences bitterly cold winters has resulted in it becoming a byword for cosiness – making it the perfect complement to a roaring fire or stove. Here’s how to bring Scandinavian interior design and the concept of hygge to your home. One of the most predominant features of Scandinavian interior design is the absence of carpet. And whilst this might sound like the opposite of ‘cosy’, the pale, unvarnished wood floors that are the hallmark of this style add a rustic warmth that’s perfect for cold winter evenings. Scandinavian colour schemes are a product of the long dark winters in the Nordic countries, with lighter tones to add brightness to the space. Pure white can be a little clinical though, so instead opt for very pale greys and blue hues. As with flooring, pale woods are a hallmark of Scandinavian style furnishings. A mixture of wooden and white furnishings, as in the image above, is particularly effective. When it comes to the sofas, a darker grey can be the perfect way to make the cosiest part of the room the focus. Scandinavian furnishing is also always simple, with clean lines and uncomplicated form – mid-century pieces by designers such as Charles Eames and Arne Jacobsen are often used, and look just as up-to-date now as they did when they were first envisioned. The harsh winters of Scandinavia mean that you’re unlikely to find a Scandinavian living room without a stove or fireplace and gently flickering flames are, of course, the ultimate way to add cosiness to your space. Get the look of the white stove in the image above with our Carron Cream Enamel stove, or view our range of traditional stoves and contemporary stoves, which will be just as effective. Once you’ve established the ‘essentials’ of the Scandinavian look, you can have a bit of fun with your interior. If you’d like to add some colour, blue is undoubtedly the most Nordic accent shade. A blue rug, chair (see the image above), lampshade or throw can be the perfect complement to your colour scheme. White paper lanterns look great against a Scandinavian colour scheme, and will create a soft, cosy light. Copper lampshades are also particularly effective against the pale greys and whites of Scandinavian style. Simplicity is the key to a classic Scandinavian interior – invest in plenty of built-in storage for a minimalist look, and keep surfaces uncluttered. Scandinavian colour schemes might be muted, but warmth is added through texture. One of the easiest ways to get the look is to invest in fur throws and rugs, as well as a variety of other textures such as knitted pieces and unpolished wood. The textured wood, muted colours and fur throws of Scandinavian design are all about keeping things natural – so plants are a great addition. Stick to all-green varieties that have leaves all year round. 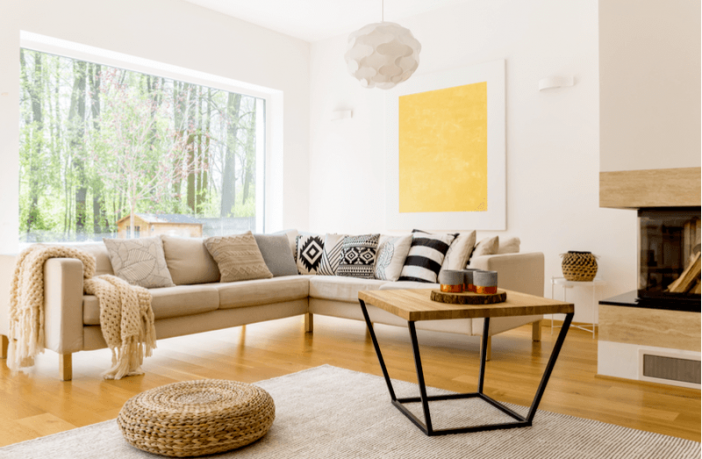 The key to great interior design is individuality – and the great thing about Scandinavian interiors is that they are largely a blank canvas that can easily be modified. Whether you love florals or bright prints, a splash of colour or pattern, in moderation, will look great against your Scandinavian interior. See the wall art and cushion in the image above for a great example of how effective this can be. If you’re looking to create a cosy home, ‘Scandinavian’ is the perfect interior design style – plus it will bring a little bit of hygge into your life. Have you got any more tips for creating a Scandinavian interior? Let us know in the comments.